The global gym equipment market is expected to be worth $1bn by 2023. Once dominated by the USA, one British manufacturer has spent the last 20 years working from an industrial estate in rural Somerset and established itself as one of the world’s premier manufacturers of high-end gym and personal fitness equipment. “It started in 1999, just me on my own as a bit of a part time thing to earn some extra money, and then it quickly developed into something a bit bigger,” begins Simon Watson, Owner and Director of Watson Gym Equipment. Simon, a welder by trade, started out re-manufacturing commercial food processing equipment before combining his passion for fitness and welding and started the company in 1999. Entering its twentieth year, Watson Gym Equipment now employs over 30 full-time members of staff and operates out of two sites in Frome, Somerset. While the company started out designing basic weights benches and frames, Simon – who still designs every piece of equipment himself – soon saw that the real growth potential lay in carving his own niche within the sector. The company now supplies high-end private gyms both in the UK and beyond, an exports over 75% of products to a growing customer base in Europe, the Middle East, Australia and the USA. Key to Watson Gym equipment’s growth has been its ability to manufacture most of its product portfolio in-house. However, that was not always the case. “We started making dumbbells eight years ago. While we could manufacture and assemble a lot of the product components ourselves, we didn’t have the capacity to manufacture the parts that go on each end of the unit,” Simon adds. The company’s first machine tool was a Mazak VCS 530C vertical machining centre, which was used to machine weight stack plates and stems. 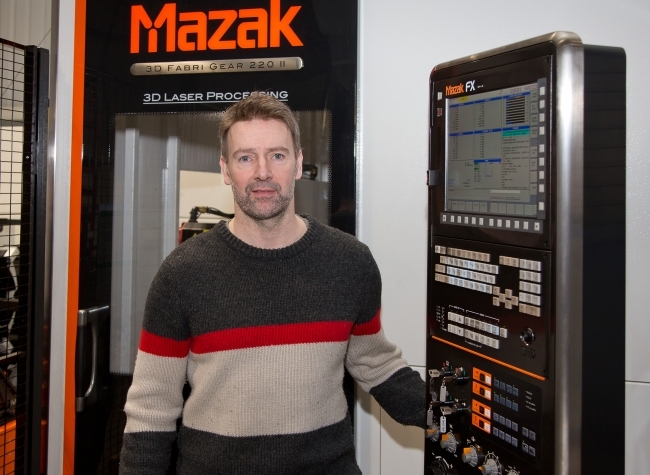 It wasn’t long before the original VCS 530C was running at full capacity, so to meet growing customer demand, Simon purchased a second Mazak lathe, complete with a larger second spindle to handle full-size billets. Now Watson Gym Equipment is making some of the best dumbbells in the world, used by globally-renowned trainers such as Nick Mitchell, Charles Poliquin and Ben Pakulski. 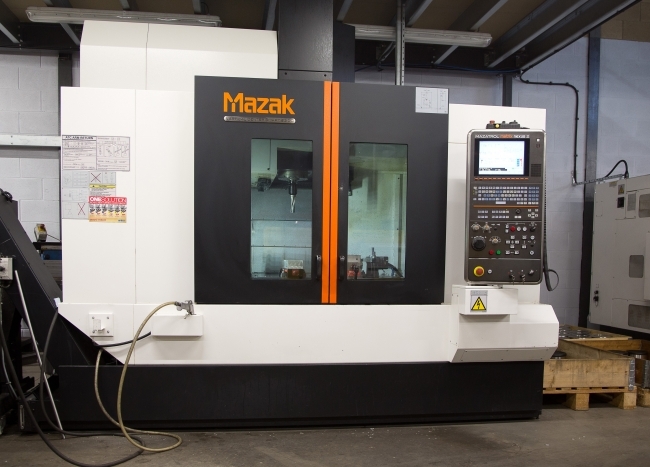 Following the success of the company’s initial investment with Mazak, which also involved the purchase of two QUICK TURN NEXUS 250-II MS turning centres, it wasn’t long before Simon turned his attention to how he could further streamline production by expanding the company’s in-house manufacturing facilities. In late 2017 the company took delivery of a Mazak 3D FABRI GEAR 220 II laser processing machine. “The FABRI GEAR has made a huge impact on our business, not just in terms of efficiency and speed, but it has allowed us to redesign our weight machines to make them stronger, faster to assemble, and more consistent. For example, you can notch bits of steel together so they can only be joined in one way. As such, the welder can’t get it wrong so they don’t need to spend as long measuring and checking as they previously would have done so. Given it was becoming increasingly difficult to find experienced welders and fabricators in this part of the world, de-skilling the role has helped us overcome recruitment challenges,” adds Simon. 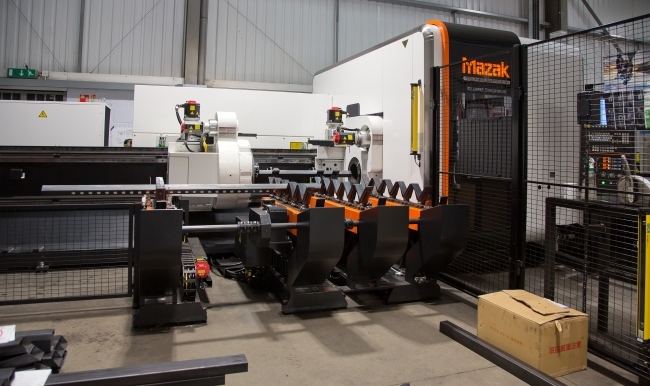 Following the success of the FABRI GEAR, Watson Gym Equipment decided to double its in-house laser cutting capacity in late 2018, by purchasing a 3.0kW Mazak OPTIPLEX NEXUS 3015 FIBER machine.